In the modern workplace, in which we are always connected, there are simply too many distractions. You need lots of discipline to really use your time effectively, besides the capacity to clearly define your priorities. You must be able to identify the reasons your valuable time is not being spent in the most effective way, and then develop methods to fix that. 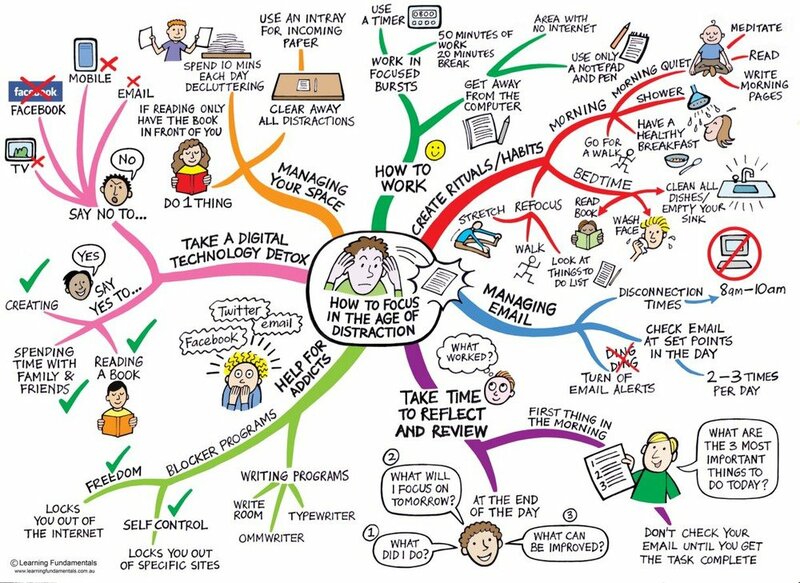 One form of distraction that is not mentioned in this chart are the meetings in the workplace. If we really want to “work in focused bursts”, we must assure that our work is not interrupted by a meeting. In my experience, this is particularly important for software developers. If a programmer is focused, he can accomplish in two consecutive hours much more than in two periods of one hour each. Every time a programmer starts working on a task, he needs considerable time to “enter the zone”, reaching a state of “flow” and working with maximum productivity. Too many meetings are certainly a productivity-killer for any professional. But, for a software developer, even a small number of meetings randomly distributed during his work day can reduce drastically his output. The question is: How can I avoid my work to be interrupted by a meeting? I’ve adopted a simple technique that works very well: When I know that I need time to work on an important programming task, I just go to my calendar and reserve this time for myself, marking it as “busy”. In other words, I create a “meeting” in which I’m the only participant, a meeting with myself. If I know I will need to work for several days on a task, I may just reserve all the mornings in a week. For example, I may create self-meetings, every day, from 8:00 to 12:00. Thus, when someone tries to invite me for a meeting, he will see that I’m busy, and then he will need to look for an alternative time in which I’m free. Better yet, he may decide that I’m not really needed in this meeting. Of course you must always leave a certain amount of free time in your calendar. After all, there are meetings in which you need to participate, and you do not want to make it extremely difficult for the meeting organizer to find a suitable time slot. Too many meetings: People are creating meetings that are not really needed. Too many participants: Too many people are being invited to the meetings. In both cases it is extremely difficult for the meeting organizer to find a time slot in which all the participants are free. Then, you will eventually be invited to meetings during your “busy” time. If your company has such problematic meeting behavior, you must discuss that with your management and your peers. That’s not something that you can solve personally using any individual technique. Finally, you should avoid as much as possible to use the “suggest alternative time” option when replying to a meeting invitation. This should be done only in unforeseen situations, for example when there is an emergency and you will no longer be able to participate in a meeting that you had already accepted. If you know that you will be busy at a certain time, you should make it explicit in your calendar as early as possible. So good luck with your self-meetings, I hope this technique will help you become more productive. You may also want to read my previous post about Super-Productivity. I will be happy to hear your comments! Nice article, I enjoyed the humor in it. I’m stealing your graph. […] I’ve adopted a simple technique that works very well: When I know that I need time to work on an important programming task, I just go to my calendar and reserve this time for myself, marking it as “busy”. In other words, I create a “meeting” in which I’m the only participant, a meeting with myself. If I know I will need to work for several days on a task, I may just reserve all the mornings in a week. For example, I may create self-meetings, every day, from 8:00 to 12:00. I used your graphic and linked to this post on my blog. Thanks! I’ve been holding meetings with myself for a number of years. Glad to know I’m not alone!